The Islamic State is in dire need of fighters, a prominent Belgian member admits. Listing the sixteen best reasons to join the jihad, he puts the lack of manpower at the second place. According to recent reports in western media, the Islamic State (IS) is so in need of additional manpower after weeks of hammering airstrikes, that it dropped most of its vetting of foreign recruits. In the past, new volunteers had to present recommendations of three established fighters before they were allowed to cross the Turkish border and enter Abu Bakr al-Baghdadi’s caliphate. “Almost any muslim who wants to travel now can”, a man responsible for a safehouse of IS in the Turkish town of Urfa told ‘The Daily Telegraph‘ last week. Writing on his Facebook page, a prominent Belgian fighter within IS now explicitly confirms that the group is in shortage of fighters. Hicham Chaïb, a former leader of the extremist organization Shariah4Belgium, listed sixteen arguments to join the army of IS. “We call upon the muslims to fight for so much reasons”, he wrote, “with the following as the most obvious.” The first one he mentioned was “to prevent the infidels to dominate”, while the second already spoke about the “lack of manpower” his group is facing now. 16. Because Jihad is the most outstanding way of worship and the Muslim can obtain the highest degrees with it. Before he went to Syria on the 19th of March 2013, Chaïb was known as bodyguard of Shariah4Belgium’s founder and leader Fouad Belkacem. But the role of ‘Abu Haniefa’ — as he was called in the organization — was much more important than flexing his muscles. That became clear when he took over the organization after Belkacem’s imprisonment in June 2012 together with two other core members, Feisal Yamoun and Noureddine Abouallal. They are both killed in Syria since. All four the mentioned men are currently on trial in Belgium for leadership of a terrorist organization — in absentia of course, apart from Belkacem. In Syria, Chaïb apparently is trying to become the new public face of his group. He did appear already in several promotional videos describing the prosperous life in the caliphate, and frequently is launching new appeals to join IS in Facebook posts. His wife Kaoutar Bioui, also known as ‘Umm Haniefa Al Belgikiya’, has followed her husband to Syria and is as radical as he. In May of this year, she even called upon the muslims in Belgium to assassinate the far right politician Filip De Winter. “May Allah enlighten our eyes with the slaughter of this pig”, she wrote. UPDATE: Chaïb’s list of arguments to join Islamic State comes literally from Al Qaida’s co-founder Abdullah Yusuf Azzam’s years old pamphlet ‘Join the Caravan‘, as Timothy Holman informed us today. So, it may be wrong to relate it to the current state of IS. It is still difficult to find an open source compilation of actual numbers regarding foreign fighters in the Syrian-Iraqi conflict. Therefore, Emmejihad has decided to provide one that will be updated as soon as new figures are brought to our attention. 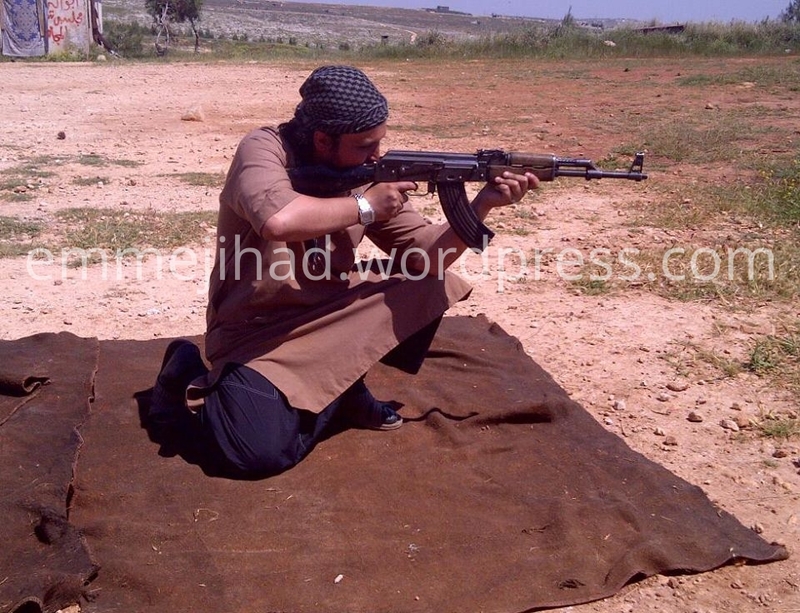 It can be found at thecountofemmejihad.wordpress.com and users are kindly invited to share the information they found. Most research on foreign fighters in the Syrian and Iraqi conflicts is focused on those fighting against the regimes of both countries — and even more specifically the extremist islamic groups such as Jabhat al-Nusra and Islamic State (formerly known as ISIS or ISIL). Some figures do include foreign fighters who are active on the other side, though. In general, those fighters tend to be underreported. But it would be wrong to consider all the mentioned foreign fighters as jihadists who are a threat outside the current conflict. At this point, it seems impossible to split up all countries’ figures for the different affiliations — which of course would be more than interesting. So we are keen to get information that will enable a more precise breakdown. The list of countries is based on the report ‘Foreign Fighters in Syria’, written by Richard Barrett for The Soufan Group in June, 2014. Countries were added when information appeared in the meantime that they have foreign fighters too — such as Mexico, Brazil and Argentina. For a base set of figures we also relied on the data published by The International Centre for the Study of Radicalisation and Political Violence (ICSR), part of the Department of War Studies at King’s College in London. These institutions and their researchers deserve a lot of credit for the work presented here. We distinguish three categories of figures, dependent on the source. The first one are official estimates as publicly announced by relevant authorities in the country itself, and in a few cases only the exact numbers mentioned by them. The second category are estimates by relevant authorities that were declared anonymously, or estimates by relevant authorities higher than their exact count. The third one are counts or estimates from unofficial sources, such as academic researchers or the media. We try to omit figures from the active parties in the conflicts — apart from the non-regional members of the so-called coalition against Islamic State — since they risk to be exaggerations. One of the perpetrators of the mass beheading that was shown in the latest video of Islamic State (IS) allegedly is Belgian. Sources within the security services are quite confident they recognized a member of Shariah4Belgium who is currently on trial in absentia. PLEASE READ IMPORTANT UPDATE BELOW. The most gruesome part of the video message in which IS confirmed last weekend that it has killed Peter Kassig, wasn’t the murder of the American aid worker himself. That act wasn’t shown. But the movie did contain chilling footage of about 20 Syrian soldiers beheaded by IS terrorists. One of them was the notorious Briton ‘Jihadi John’. He was masked and dressed in black, similar to the previous videos. His accomplices however, wearing camouflage suits, did show their face. French authorities confirmed already that Maxime Hauchard (22), a muslim convert from Normandy known within IS as ‘Abou Abdallah Al-Faransi’, is one of them. And British media identified another one as Nasser Muthana (20), a medical student from Cardiff in Wales. While those names were coming out, the Belgian newspaper ‘Het Laatste Nieuws’ was looking into rumours that a third one comes from Belgium. We didn’t get complete certainty, but a source within Belgian security services told about his confidence that Abdelmajid Gharmaoui (28) — a.k.a. ‘Abu Dujana Al-Muhajir’ — is one of the executioners indeed. Another senior official confirmed that the presence of the former Shariah4Belgium member is investigated since Sunday already, and the highly respected independent IS specialist Pieter Van Ostaeyen also thinks is it him. Apart from the striking physical resemblance, there are some other facts that make it a probable case. Gharmaoui indicated already that he is active within the propaganda department of IS and his Facebook account mentions Dabiq as current place of residence. That Syrian town north of Aleppo is rarely mentioned as such by European fighters, but it is there that the Kassig video was filmed — according to its own caption and independent Syrian media activists who pinpointed the exact location on satellite images. Gharmaoui was one of the most active Shariah4Belgium members from of the town of Vilvoorde, frequently accompanying his local leader Houssien Elouassaki at gatherings in Antwerp, the main base of the radical organization those days. 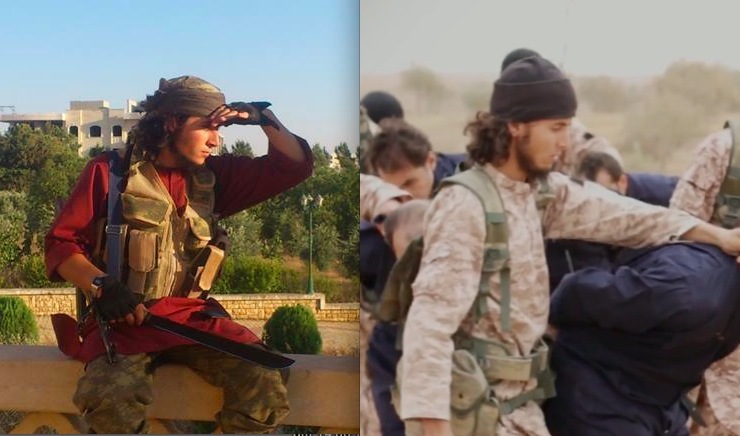 He left for Syria in October 2012 with Elouassaki’s brother Hakim and fought in the ranks of Majlis Shura Al-Mujahideen, an Aleppo based militia that was led by the Syrian brothers Firas and Amr al-Absi before becoming part of ISIS during the first half of 2013. At the trial that is currently held against 46 members of Shariah4Belgium, the public prosecutor has demanded ten years of imprisonment against Gharmaoui for membership of a terrorist organization. Like most of the defendants, he is tried in absentia. Lately, we mentioned his name when we reported about allegations of murder against a Belgian fighter who has returned and is free on conditions, Elias Taketloune. It was Gharmaoui who spread those rumours, probably as an act of revenge because Taketloune had cooperated with the police. If Gharmaoui’s implication in the recent mass beheading sufficiently can be proven, the possibility exists he will be tried for that seperately at a later stage. There are already six defendants facing such a second trial, since the most serious complaints — abduction and murder — were left out of the current case. Those complaints are still investigated and of course they can result in far more severe punishment. UPDATE (November 18, 2014 – 11u30 PM Brussels time) – In reaction to the story above as it was published in the Belgian newspaper ‘Het Laatste Nieuws’ this morning, the mayor of Gharmaoui’s hometown of Vilvoorde stated that it certainly isn’t him who can be seen in the video. “People within the security services initially thought so indeed, but in the meantime they are telling me it was a mistake”, politician Hans Bonte told. Asked for their assessment again, several sources — including a specialist in the matter within a Belgian security service — denied that their meaning has changed. So, the only conclusion is that even authorities do not agree yet on the question whether it is Gharmaoui or not. The federal prosecutor’s office confirmed it is investigating the case, but declined any further comment. And in circles of radical muslims different meanings also occur. The brother of another well known IS fighter from Vilvoorde wrote on Facebook: “That isn’t Majid”, while acquaintances from Brussels anonymously told the opposite.